Is Dr. Frankenstein Running Your Vacation Rental Company’s IT Department? Any more, there are really two philosophies when it comes to technology and managing vacation rentals. Some managers choose to use a mash-up of many different services, and others choose to use an all-in-one solution from a single provider. While the industry is currently trending toward all-in-one solutions, some managers – whether it’s by preference or by habit – are still stuck trying to stitch together multiple pieces of technology to run their businesses. But, as you’ll see outlined in this blog, there are many disadvantages to patching together your technology, in terms of costs, commitments, integration challenges and support. Below, we outline the two different approaches, take a look at the potential costs involved, and examine the pros and cons of each approach. Mash-Up – This mash-up of different technology and services is partly a symptom of the times when all-in-one software didn’t exist, when software installed on a computer had to find a way to connect online and when managers were forced to seek out different vendors to accommodate different needs. The idea of mash-ups like this are great in theory, but problems arise quickly when you look at the actual logistics. Here’s an example of a typical mash-up solution for vacation rental managers and some estimates on how much it could cost. Track interactions with guests, send emails, etc. Provides guests with reservation information, local area information, etc. Varying levels of integration with different PM software systems. Most are not real-time. All-In-One Software – A newer and increasingly popular solution is all-in-one software. This handles just about all your needs and works together flawlessly because it’s one piece of software, supported by one company. Reduces the amount of third-party integrations needed, if any. You may have specific requirements not addressed in the software (which makes the company’s development schedule important). Costs – For an all-in-one solution, like LiveRez, you pay one monthly fee based on your booking. 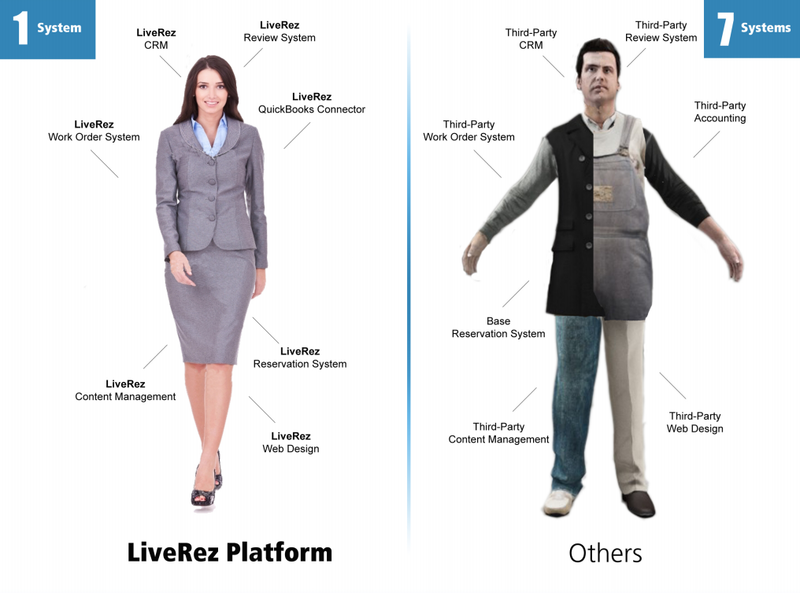 This approach helps LiveRez economically align its interests with that of its users (called partners) and means that LiveRez is successful when it helps its partners become more successful. According to a recent survey from VRM Intel, integration between technologies was rated as the biggest challenge that vacation rental companies face when it comes to technology. Not so surprisingly, the second rated factor was multiple points of data entry, which is often a symptom of missing integrations. While these problems can pop up no matter what approach you take, choosing a quality all-in-one solution can help mitigate these issues. No approach is perfect, but there are definitely approaches that work better than others. Regardless of what approach you choose, make sure to check ahead of time before adding a new piece of technology to make sure it is compatible with your current software system(s) or can adequately replace or upgrade your current system.